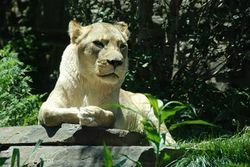 The Transvaal lion is a subspecies of lion that is also known as the Southeastern lion, because they mainly lives in southern parts of Africa. Their social structure is the largest compared to other lions. Males usually protect their tribe and females are hunters. They eat animals like zebras that are around African grasslands. Video of an animal behaviourist, Kevin Richardson forming a remarkable bond with a entire tribe of South African lion. 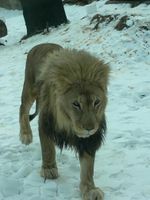 ↑ 2.0 2.1 2.2 Panthera leo krugeri The Big Zoo. Web. Accessed 25 Mar 14. Author unknown. ↑ 3.0 3.1 African lion (Panthera leo krugeri) Lincoln Park Zoo. Web. Accessed 25 Mar 14. Author unknown. ↑ 4.0 4.1 4.2 South African Lion Denver Zoo. Web. Accessed 6 Apr 14. Author unknown. ↑ BASIC FACTS ABOUT LIONS Defenders Of Wildlife. Web. Accessed 25 Mar 14. Author unknown.